A special service to honour two local men who fought in the Battle of Britain will be held at a cemetery in Co Antrim this weekend. The memorial service at Islandmagee New Cemetery on September 2 will pay tribute to Whitehead men Squadron Leader Noel Henry Corry DFC, AE and Sergeant John ‘Johnny Mac’ McAdam, who are both buried at the site. As part of the commemoration events, the Battle of Britain Memorial Flight will carry out a flypast over the graveyard. Aircraft from the Second World War period will be taking part in the flight, which is estimated to take place at approximately 4:45pm on Saturday. 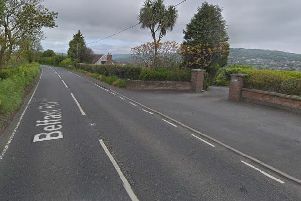 Local author and historical expert, John Hewitt has been campaigning to have the flypast over the Islandmagee cemetery for a number of years to honour the two Whitehead pilots and all of Northern Ireland’s pilots who served in the Battle of Britain. Noel Corry survived the war and became a civil servant. His service in the RAF is quite unique as he served in both Fighter Command and Bomber Command. He passed away in 2006. John McAdam served through the Battle of Britain with No 41 Squadron at Hornchurch and he was credited with shooting down six enemy aircraft . He was shot down three times himself and survived, going back to his squadron to fight again. On February 20 1941 Sergeant McAdam perished after being shot down over Dover. He was alive when he baled out of his Spitfire, but when he was picked up from the sea he was dead after being shot in the back while descending in his parachute by a German shell. His body was brought home and buried in Islandmagee. Political and community representatives will join with members of various military associations and relatives of the pilots to commemorate the local men who served in the Battle of Britain. Wreaths will be laid and an Act of Remembrance will take place. Those in attendance will also hear tributes paid from HRH The Prince of Wales, the Patron of the Battle of Britain Association, who has sent over kind words in memory of Noel Corry and John McAdam.